Training Managers by Working on a Production Line? The goal of Grenoble Ecole de Management's pedagogic innovation is to go beyond theoretical classroom learning and provide managers with new skills thanks to creative learning approaches. A recent custom program for managers at April saw 15 of the company's managers immersed in one of Caterpillar's production lines. April is an international insurance and assistance company for individuals, professionals and businesses. With services in more than 32 countries, the company has 3,800 employees. Last March, the company launched a custom training program to train its managers in partnership with Grenoble Ecole de Management. The first training session welcomed 15 of April's service and business managers. 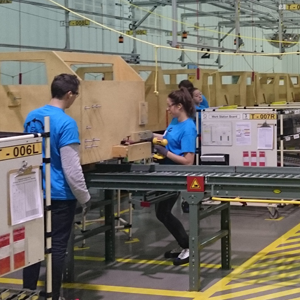 The participants were immersed in a real-life production line at one of Caterpillar's locations in Grenoble. Participants working on the production line were confronted with the demands of a quick production pace as well the heat and noise generated when working on a production line. "Ten percent of learning takes place during formal teaching sessions. Twenty percent during more informal 'social learning' which can come from the TV, internet, social networks or discussions. But 70 percent of learning happens 'on the job' and it's a very personal experience." explains Gaël Fouillard, Director of Executive Education at Grenoble Ecole de Management. During the training session at Caterpillar, the managers took part in a collective experience that allowed them to learn or reinforce management skills by living through real challenges. The managers' work on the production line was combined with time dedicated to individual and collective reflection. The participants were able to develop this thought process further thanks to specific knowledge and experience shared by April team leaders and Grenoble Ecole de Management consultants. "The goal was to shift away from formal training based on theory and build a learning experience based on the realities of working in the field." adds Véronique Galdin, director of April's company university as well as HR development in France. This Leadership and Service Management program was designed to share a set of management skills that match the company's values. "We wanted our managers to be able to step back from their usual practices and think critically about their behavior and attitude in terms of management. The second goal was to develop team work by collaborating together on a concrete project. In the end, this development will help our managers, teams and organization as a whole transform its approach." says Véronique. "This custom training program was designed with Grenoble Ecole de Management's teams. Following their first concrete learning experience, our managers will take advantage of virtual classes built around the subject of confidence. They will benefit from individual coaching to work on their personal development. Team workshops will focus on developing concrete projects for the company. There will also be personal development sessions thanks to conferences and workshops on public speaking, agility, stress management or innovation management." adds Véronique. The program was purposefully designed to encompass all managers, regardless of their level in the company.